I used to weep at the bushels full of peas set before me as a kid tasked with shelling them. The weeping had as much to do with yield as with the task itself. A giant pile could reduce to a mere cup or two. Later, snow peas and sugar snap peas came to my attention, and I reveled in the fact that I only had to top-and-tail them and maybe pull some strings. Yet every year, I go to a pea-picking farm or the farmers market and get a few quarts or even a half a peck (4+ quarts) of shelling peas. The last time I went to the farmers’ market, just before the July heat wave set in, I brought home slightly older shelling peas and some slightly over-the-hill snap peas. Fresh enough but not going to make a gorgeous early spring pea and mint soup like last year’s. I decided to make a soup with the peas and leeks, both at the end of their season, and a potato, at the beginning of its. The reason for the potato was to make a creamy soup without using dairy products. 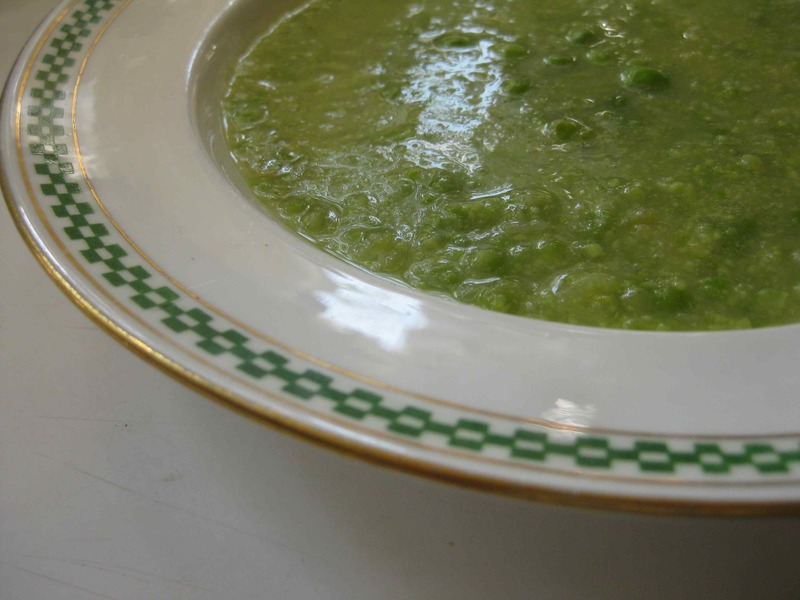 The foundation – you guessed it – was a broth made of the pea pods and leek trimmings. After cleaning them well, I chopped the pods and leek greens, placed them in a wide saucepan covered with lightly salted water to a level about an inch above the vegetables. After simmering them for about 30 minutes, I drained the liquid and put the solids in the compost pile. If you are keeping the broth for another day, make sure you cool it completely before storing it. It can be frozen, just like the corn stock that I make from the leftover cobs. For the soup, there’s no specific recipe or even a formula. To retain color, first blanch a couple of cups of peas in plenty of boiling water, salted, and remove them to cool. (If your kitchen is hot, you might plunge them in ice water to retain the color.) In a large saucepan, saute a chopped leek in butter or oil or a combination, add a peeled and chopped medium waxy potato, and toss to coat. Add enough broth to cover the vegetables by about an inch, and bring the mixture to a simmer. Cook, covered, until soft. Add the peas to warm them and then puree the mixture with an immersion blender or in a food processor. I kept the mixture slightly coarse and added a few reserved whole peas at the end. Season to taste, adding salt, pepper and/or herbs such as mint, tarragon or lovage. You can add milk or cream, but I didn’t think dairy was needed.